Flat Fee Trademark Proudly Celebrates 10 Years in Business! Flat Fee Trademark Proudly Celebrates 10 Years in Business! 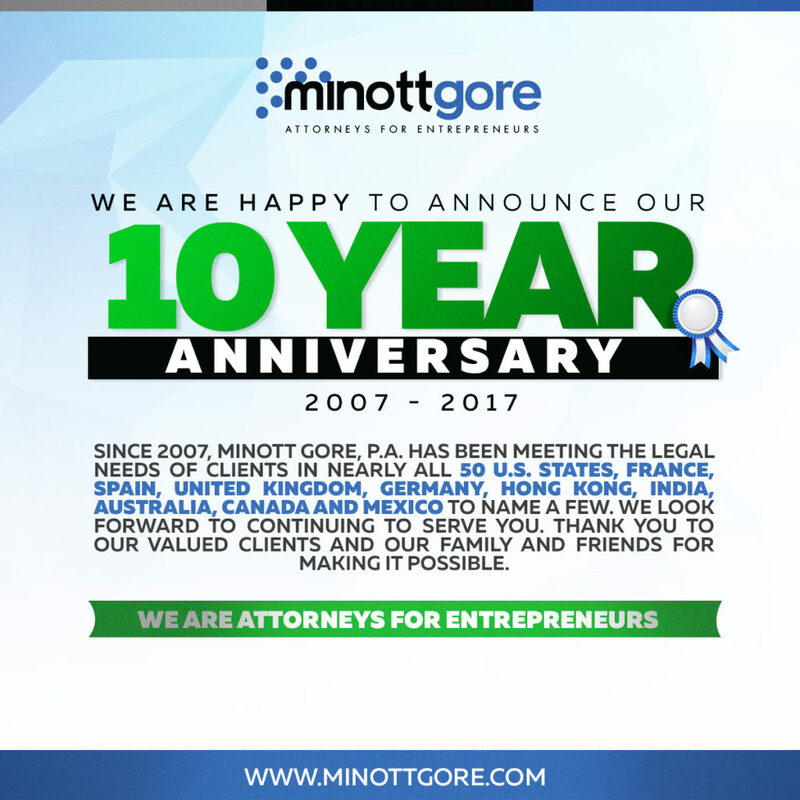 The Law Office of Minott Gore, P.A. and FlatFeeTrademark.com proudly celebrate ten years providing an online trademark attorney service this summer. On July 4, 2007, we launched our firm with one simple idea. To provide high quality, professional legal services to entrepreneurs, start-ups and small businesses at affordable prices. At the time, we were five-year veterans of big law firms in Washington D.C., staking our claim in entrepreneurship. With the knowledge, skills and mentorship acquired from working at some of the nation’s biggest law firms, we set out to create a new kind of law firm. A modern, technologically driven firm. One that is nimble, responsive and adaptable to the needs of today’s entrepreneur and small business. The result was Minott Gore, P.A., a business and intellectual property law firm, followed shortly by the launch of FlatFeeTrademark.com, one of the first online trademark services wholly owned and operated by licensed trademark attorneys. From 2007 to 2017, we are still here. Our firm has since grown to serve clients across nearly all 50 U.S. States, France, Spain, United Kingdom, Germany, Switzerland, Nigeria, Hong Kong, India, Australia, Canada and Mexico to name a few. We look forward to continuing to serve you. Thank you to our valued clients and our family and friends for making it possible. Permalink: FlatFee Trademark Attorney Service Proudly Celebrates 10 Years!